In one sense, it seems laughable that anyone seeking to become President of the United States would make an appeal to Christian voters by promising Christians power. Of course, that is exactly what Presidential Candidate Donald Trump has apparently done by talking about Christians and saying that if he’s elected, “you’re going to have plenty of power.” But this post isn’t really about Donald Trump or any other Presidential Candidate. It’s about the Christians for whom such a promise of power is desired. When Jesus began his public ministry, the burning question for Israel had to do with the Kingdom of God. As a people who were living under the rule of Roman authority, Israel longed for God to make good on his promise which meant the restoration of his Kingdom. That was Israel’s hope. As a prophetic voice, teaching with authority and performing all kinds of miraculous signs, Jesus raised the possibility that he was indeed the Messiah who would restore the Kingdom of God. Yet as Jesus defied some of Israel’s traditions, challenging the authority of the religious leaders, those in authority began to see him as a blasphemer and eventually would help conspire to have him crucified under the rule of the Roman Governor Pilate. However, God raised Jesus from death, vindicating him as Israel’s Messiah and so his disciples held out hope that he would restore the kingdom of God. In Acts chapter one, the disciples asked Jesus when he was going to restore the kingdom. The question is about power but it is something that they still misunderstood. Jesus replies to his disciples saying, “It is not for you to know the times or dates the Father has set by his own authority. But you will receive power when the Holy Spirit comes on you; and you will be my witnesses… (vv. 7-8). Jesus was assuring his disciples that they would have power but not the kind of power they have in mind. Receiving the Holy Spirit to live as witnesses of Jesus is not the power of militant or political coercion; it is rooted in the same power of the cross. The Kingdom of God appears as the disciples live as witness of Jesus, the crucified and resurrected Messiah, embodying his way of life as their way of life. Maybe Christians today have forgotten this or maybe they just don’t want to embrace it since it’s not desirable like the power of militant and political coercion! Many Christians read Acts with admiration for the way the early church so rapidly grew, dreaming of how their own local churches could experience such growth. Many other believers lament the decline of Christianity’s influence in much of North America, hoping that somehow America could return to whatever Christian values they believe the nation once had. All the while, Christianity in America appears ever closer to losing sight of Jesus and the gospel he proclaimed even as local churches are declining as their witness is becoming marginalized. Perhaps that sounds overly critical and you think I am painting with too broad of a brush stroke. Perhaps I am and perhaps I am too critical. However, the only reason why any Presidential Candidate is appealing to Christians (though certainly not all) with an assurance of giving them power is because there is a large enough group of Christians who desire such. So here is an important truth: The desire for such power says more about Christians than it does Donald Trump or any other Presidential Candidate and what it says is not good… it even raises the question of idolatry. The desire for any form of militant and political power places Christians with the masses who demanded that Pilate crucify Jesus. Don’t get me wrong! I’m not saying that a desire for coercive power is a desire to crucify Jesus. What I am suggesting is that those who demanded the crucifixion of Jesus from Pilate wanted the Kingdom of God but not on the terms of the God the Father revealed in Jesus. They wanted a kingdom in which they ruled with political coercion and were ready to use militant force in order to secure that power. The desire to protect and preserve Christian values and a Christendom culture among America, which is the sentiment that Trump is appealing to, is a desire to have power over others and that is the same desire as those who crucified Jesus. But there is a cost… The price of attaining political power over others is the Kingdom of God because nobody can rule among this world and participate in the Kingdom of God. Only Jesus has received the authority to rule this world! I am writing this because there are other followers of Jesus who see the same problem, even if they might express it differently than I. My hope is that this might help raise awareness of the problem and provide a corrective that is rooted in the gospel of Jesus Christ. The local churches we fellowship with need us to speak out and call us back to the way of our crucified and resurrected Messiah, Jesus of Nazareth. The pursuit of any coercive power is one we pursue to our own peril. However, the good news is that when we let go of the desire for such power, we gain the freedom to love one another and even love those whose beliefs, values, and lifestyle is drastically different then ours. Rather than wasting time trying to win political arguments about who should become the next President of the United States, we can spend time being present with people, loving and serving them, and showing them who Jesus is. This is the power of living by the Holy Spirit as witnesses of Jesus and it’s the only power we need! 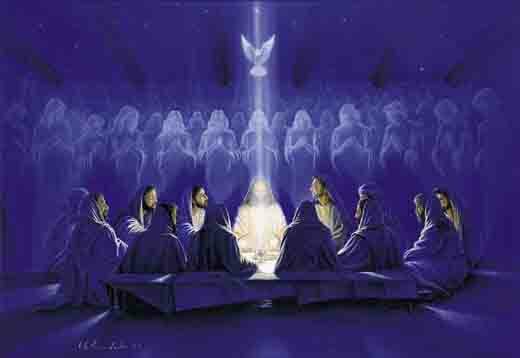 When we live by the power of the Holy Spirit as witness of Jesus, the Kingdom of God appears here on earth as it is in heaven!